How may I thank all you kind souls who left sweet comments both here and on Ravelry concerning Tristan's winter pullover? He was truly touched and most grateful and a little bit proud too which is a good thing as he can be quite self-effacing. I read every word to him and watched him blush and glow. A sight to behold. Despite the unseasonally clement weather January has brought this year spring is not quite ready to limber up. Timid bunches of naked green, which usually herald my favourite flower, the snowdrop, have not made their appearance yet. However a couple of birds shared their demure song at dawn this morning and I felt most hopeful. It was enough to fortify my heart after a mostly grey and damp week. On Sunday I visited my favourite florist in the old part of Tours, after an enjoyable morning drinking coffee with new friends, and purchased a portly bunch of palest pink and white hyacinths to celebrate Angélique's fourth birthday on Monday. It's a little tradition of ours. Don't you think they set off this hat of mine well? Rosewater is a delightful (and addictive) pattern which has been inspired by the famous Scottish architect and artist, Charles Rennie Mackintosh and his rose designs. Rosewater, stylised roses, Madelinetosh DK yarn in the Molly Ringwald colourway - think of the 1980s film Pretty In Pink - all comprise delightful ingredients in my book! I often turn fondly to the copperplate engraving above when I need a little springtime inspiration and a splash of delicate colour. I first came across it in the rare manuscripts department of La Bibliothèque nationale in Paris during my research on Baroque gardens and parterre designs a few years ago. It is the frontispiece from Crispijn van de Passe junior's masterpiece Hortus Floridus first published in 1614; a Florilegium conceived against the backdrop of the Tulipomania which raged first across Holland and then spread swiftly to Europe until it died a violent death in 1637 due to its self-inflicted economic crisis. 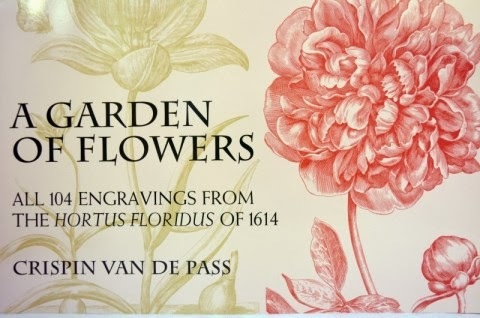 Bulbous and tuberous plants were highly fashionable and the first part of this book, The Spring Garden, contains an exquisite collection of spring flowers many of which had been introduced to Europe towards the close if the sixteenth and during the early years of the seventeenth century. Tulips, hyacinths, auriculas and crown imperials were rarities and treasured as though they were jewels at the time. 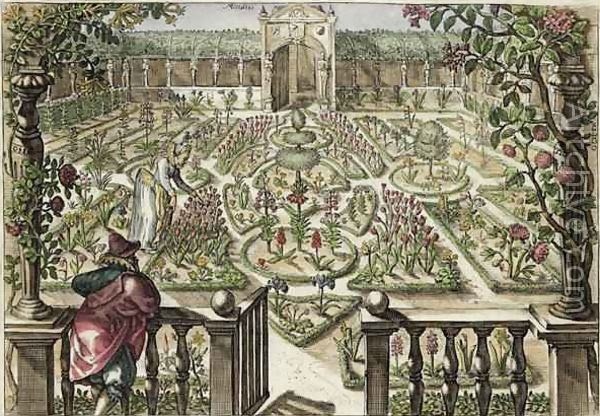 Equally prized at the time was French garden design and a few detailed engravings mark the beginning of each season in the book. "Hereby added the way in which the flowers according to their own colours should be painted or illuminated to the service of all curious lovers of flowers." There is, if you are interested, a beautiful reproduction of an early twentieth-century edition which is available for purchase at a very affordable price here. And the pictures above? 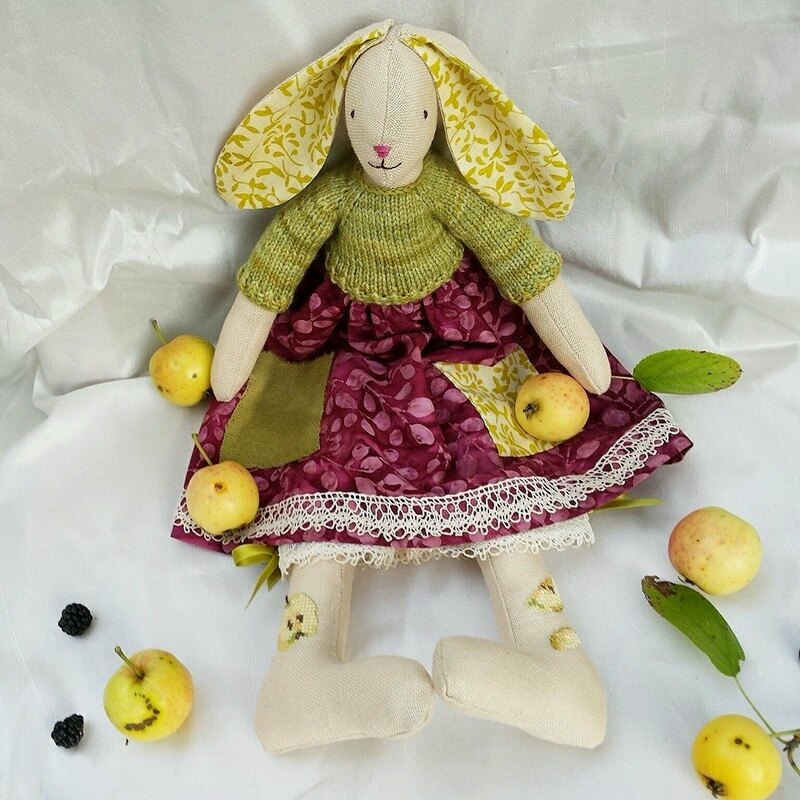 Well, the long-limbed creature is a doe who goes by the name of The Spring Gatherer. She was my first creation this January and heralds the first throws of spring together with my newly acquired passion for patchwork which you can also see in its rudimentary glory in the doll's quilt I stitched for Angélique's fourth birthday gift - proficient patchworkers please avert your gaze! I had so much pleasure making it; it's a flowerbed of sorts with a tiny embroidered mouse with armfuls of blooms - can you see it? I mixed vintage French fabrics with scraps of Liberty but the BEST thing about this quilt is the handful of pink tatted lace flowers I have sown (yes, 'sown' not 'sewn'). They are the work of a remarkable Australian lady, Robyn, who gifted me the most exquisite lace I have ever clapped eyes on. I will be taking more pictures of these beauties very soon to share with you. Can you see one on The Spring Gather's bag? When I look at Robyn's tatting I am lost for words at the perfection of those flowers and butterflies. Can you believe she made them on a train journey to Prague and then Paris? The weather may have been overcast but the week has been full of treasures. I wish you all many happy moments over the next few days. ps Will anyone else be joining in Laura's The Year In Books project for the first time in Feburary? Some folk cannot abide winter - there's too much talk of death in the garden - and grumble when temperatures hit zero. Aside from the unpleasant truth of lurking stomach bugs and heavy colds I love it. I don't consider winter a hardship. It grants us many happy evenings of warm firelight and play (whether it be with yarn, musical instruments or playing cards), plenty of conversation and, just as importantly, another lens through which to see nature. Winter is a time to observe the wood and the trees. Barren branches against a pale blue sky are restful to the eye, and stunning too. The searching eye must prowl the wintery landscape learning the beauty of minimal colour palettes and stark silhouettes. Here in the Loire Valley winter generally brings damp cold, rising water levels and precious little snow. There is less sunlight of course (although this January, so far, we have been treated to a lot of sunshine) thanks to the slight tilt of the Earth, when rays strike at a shallow slant and the sun just doesn't feel as warm. But when the frost strikes, or better still, snow falls, then childhood excitement returns as everything glitters like diamond dust and I find myself weaving fairytales both in my head and in our everyday life. Mother Hulda (my version is a French adaptation), Jacob and Wilhelm Grimm's fairy tale, with its all-female cast, puts to the forefront the goddess of Pre-Christian German and Scandinavian folklore who single-handedly rules the weather; sunshine, snow and rain. Mother Hulda is associated with spinning and weaving and in this wintery tale her cardinal role as patroness and guardian of all maidens is to shape the two sisters' destinies. Mother Holle's eiderdown must be shaken thoroughly by a hard-working girl causing the feathers to fly about and the people in the world below to believe it is snowing. And that slender, delicate maiden who has surely caught your eye above? She is a winter fairy or, perhaps, a snowflake turned into the shape of a girl dressed in the finest white gauze with slippers sparkling like snow crystals. She is also the work of the remarkable Verity Hope who paints, snow fairies aside, an evocate picture of life in sun-drenched Provence amidst the lavender fields. I have wrapped her in tissue paper for Angélique's fast-approaching fourth birthday. Finally, let us please turn to Tristan who does not get enough of a look-in both here and on Ravelry, averaging at around one pullover a year, poor child, which is quite shameful as I think about how palpable his excitement is when asked to chose a pattern and colour scheme for himself. And as I observe him posing proudly for his photo session I marvel how such a dynamic, bouncy child can be so still and receptive to the camera unlike dear Héloïse who is always in movement thus causing many a blurred picture! Dear Tristan, my guitar player and lover of anitque cars - or any car for that matter - is possibly the greatest weaver of stories in our family. His imagination seems pretty boundless and his fountain pen nib scratches his ragged, hand-cut exercise books most weekend mornings. Perhaps, as Héloïse said recently, his tales are good because he strives to tell them without paying too much heed to perfection. The odd spelling mistake or three will not hamper his enthusiasm! He chose Veera Välimäki's High Water in Quince & Co.'s worsted-weight Lark in the wintery colourways; Frost and Winesap.The pattern is plain sailing except for the joining of the collar to the yoke which left me puzzled for more hours than I care to mention. Fortunately a fellow knitter living in Northern Norway, who is writing a thesis on brown bears, came to my help with a very useful diagram. If you would like to read more about the simple techniques I acquired whilst knitting this pattern my Ravelry notes may be found here. Happy weekend to you, dear readers! Thank you very much for all your kind comments which warm my heart. Slowly, [Margherita] began to realise that the hair was not all the same colour. Some of the tresses were more red than gold, some more gold than red. Some hung in tight twists and ringlets, some were smooth and silky, and others formed soft loose curls. Each flowed and coiled into the next, like a river that ran one moment in quick rapids, then fell in a foaming roar, before winding in lazy loops into a tranquil pool. By the power of three times three, I bind you to me. Nor stir from this place where I have cast thee. It was as if her words wrapped chains around Margherita's wrists and ankles and tongue, fettering her. She could not move or speak, though whimpers of terror struggled in her throat. Kate Forsyth, Bitter Greens, p. 136. Last summer, an amazing young lady named Claire, sent me a plump parcel full of exquisite yarns, the colours of which had been inspired by a card of Rapunzel my children had chosen for her. After a few months of casting on and unravelling a variety of promising patterns which I had hoped would do justice to the Rosy Cochineal silk and baby camel yarn I finally turned, for the third time, to Dani Sunshine’s Vintage Bouquet for which you will find my Ravelry notes here. Whilst knitting this shawl I embarked on a fascinating voyage into the origins of the Rapunzel fairytale thanks to Kate Forsyth’s, intriguing novel ‘Bitter Greens’ which, to my great delight, bought me, via late sixteenth-century Venice, full circle to the court of Louis XIV - the seat of my beloved late seventeenth-century aesthetics research. In Bitter Greens Charlotte-Rose de La Force's story becomes interwoven with the original strands of the Rapunzel tale. She was an independently–minded woman from a noble family who caused several scandals in her quest to live a life that was self–determined. After publishing satirical works concerning King Louis XIV and an elopement with a minor Charlotte-Rose was exiled to a convent where she wrote her collection of fairy tales and a series of popular historical novels. It is not hard to see why the story of a maiden locked away in a tower would appeal to her although scholars are puzzled as to how she gained access to the original Italian tale. Instructive though it might be Kate Forsyth's novel is also the perfect companion for long winter evenings curled up in an armchair by the fire. Three women, three lives and three stories are braided together in a compelling tale. Have you read it? If so I would love to have your opinion! For those who might like to read the original Petrosinella I strongly recommend Jack Zipes's translation found in this book. Unfortunately, I cannot find an English translation of the French Persinette which is to be found in this collection. I am pretty sure I will be laying my hands soon on this recent publication about the Rapunzel tradition. And those boots? They are, of course, the exquisite work of my favourite shoemaker, Ren from Fairysteps. Unique, soft, light and built to last for many years. I am absolutely certain I won't be bumping into another pair of feet in France as well shod as mine! Rapunzel would have been grateful for such a comfortable pair of shoes once she broke free from her hellish confinement. And because one fairytale often leads to another, here is the French artist, Miss Clara's, most recent work of art; The Princess And The Pea which is now available in English. My most important message to each and every one of you, dear readers, is A VERY HAPPY, PEACEFUL, and MAGICAL New Year! Oh, the undeniable thrill of a blank book waiting to be written. Which begs the question; do you have any dreams for 2014? ps With many thanks to Héloïse who posed under the rainclouds as a rather cheerful Rapunzel on New Year's Eve. We had fun, didn't we? ps I've just noticed that my shoes are featuring on Ren's Fairysteps header over here.